While leading the Friday evening services, the Rabbi noticed a member of the congregation, Bernie, walk in with a St. The Rabbi, horrified, asked the Cantor to continue the service and went to talk to Bernie. Rabbi: "What are doing here with a dog?" Bernie: "The dog came here to pray." "Oh, come on." says the Rabbi. Rabbi: "I don't believe you. You are just fooling around; that's not a proper thing to do in temple." Bernie: "Its true!".. "Ok", says the Rabbi, "then show me what the dog can do." 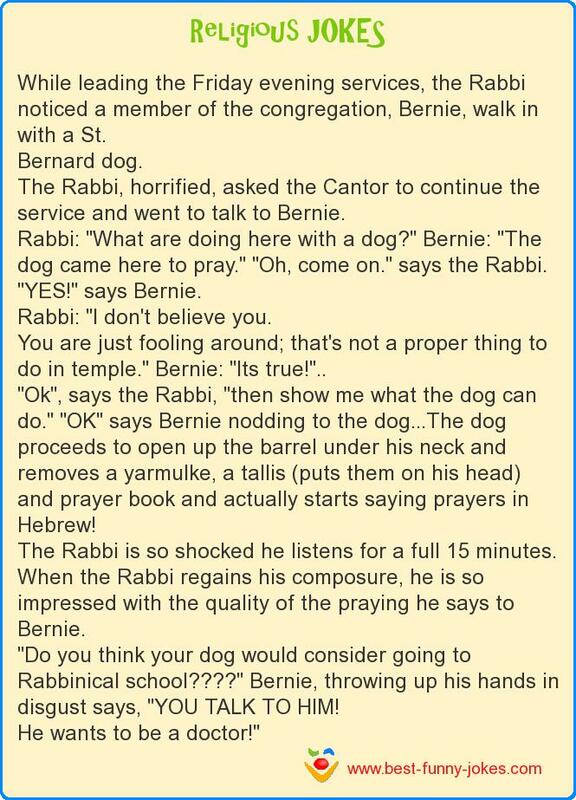 "OK" says Bernie nodding to the dog...The dog proceeds to open up the barrel under his neck and removes a yarmulke, a tallis (puts them on his head) and prayer book and actually starts saying prayers in Hebrew! The Rabbi is so shocked he listens for a full 15 minutes. When the Rabbi regains his composure, he is so impressed with the quality of the praying he says to Bernie. "Do you think your dog would consider going to Rabbinical school????" Bernie, throwing up his hands in disgust says, "YOU TALK TO HIM! He wants to be a doctor!"